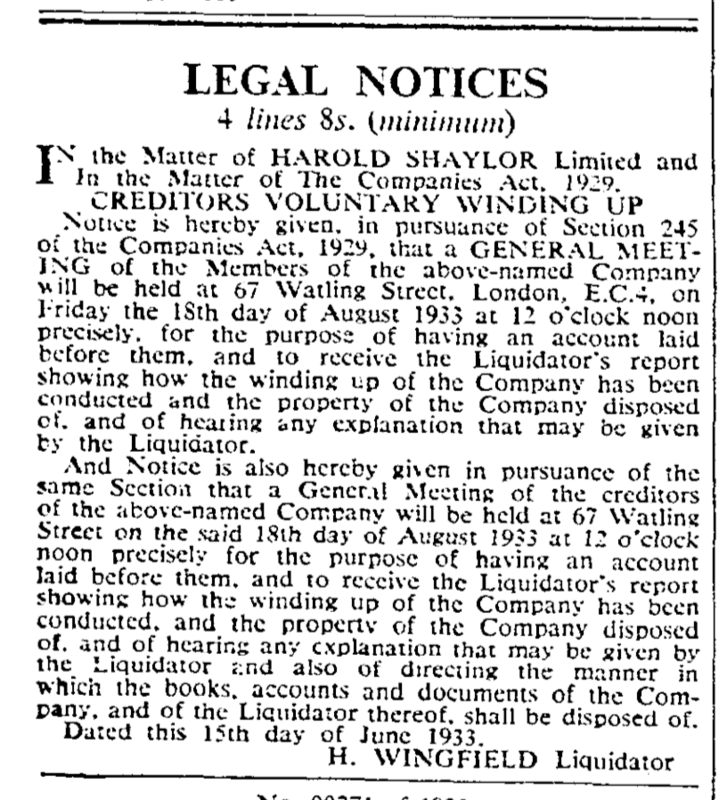 Harold Shaylor had been the manager of Brentano’s London publishing office in 1930 when it closed, and he acquired their authors and stock and renamed the firm Harold Shaylor, Ltd. 50 or so titles were published under the Shaylor imprint, including 4 titles in the Modern Writers Series, and an additional 3 titles (one of them revised) in the Modern Writers and Playrights Series, both variations of series edited by Thomas Moult. An advertisement for the series was published in an April 1931 issue of The Countryman. Three published volumes are included along with a prospectus for the series. Three more titles are included as “Coming shortly.” None of these three would actually be published in the series by Shaylor. 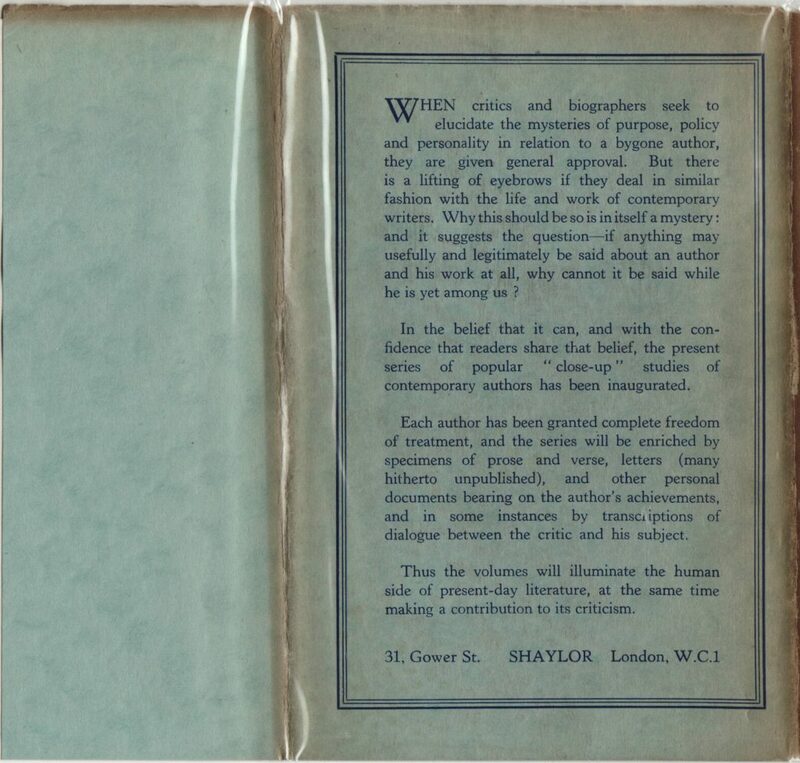 As part of the bankruptcy, Shaylor sold the Modern Writers Series to another London publisher, Thornton Butterworth. 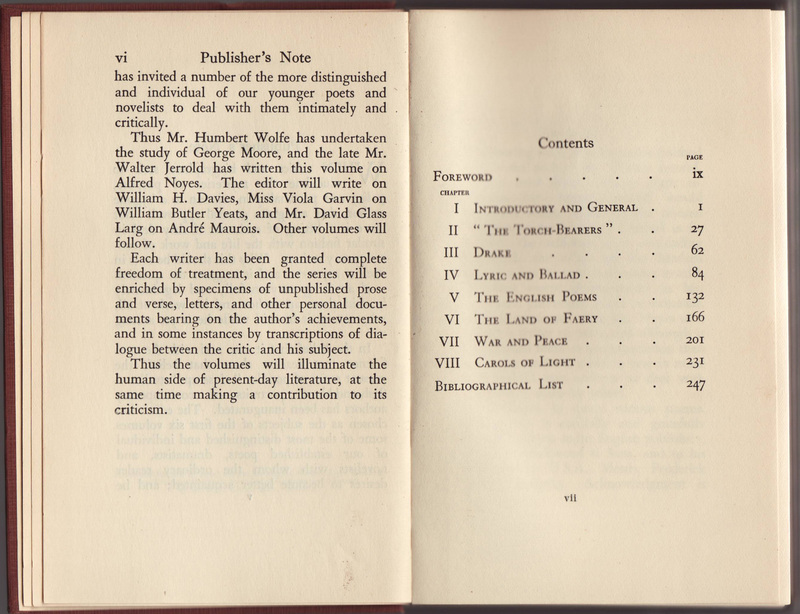 Butterworth maintained Thomas Moult as the series editor, and series titles under the Butterworth imprint first appear with a 1931 date. An advertisement from November 1932 draws attention to the 4th title in the series, John Masefield, by Gilbert Thomas. This title was the last title issued by Shaylor in the series but was also printed under the Butterworth imprint. Also listed are the three previously published titles (Maurois, Moore, Noyes). If counting unique titles (and not revised or reissued titles) we have a total count of six titles issued by both publishers in the series with one ghost title (announced, but not published). 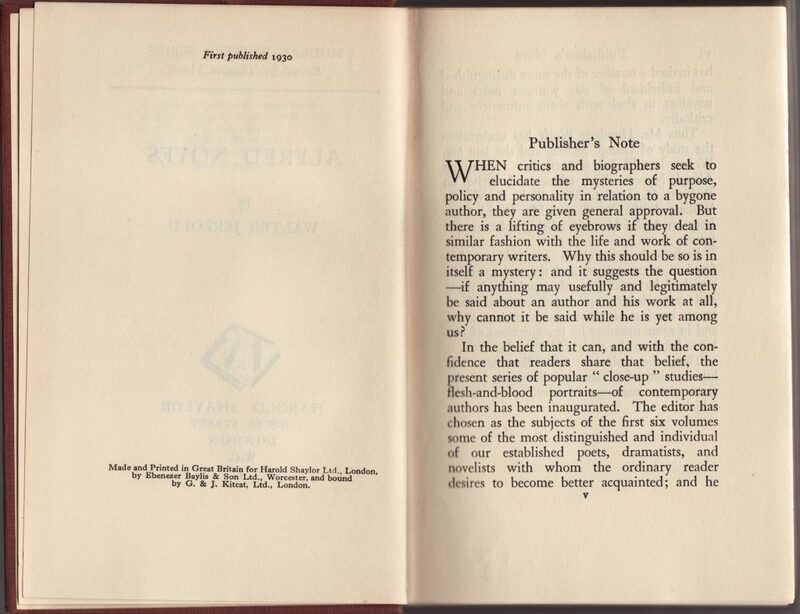 No new titles appear after 1934, but there are reprints until at least 1941. 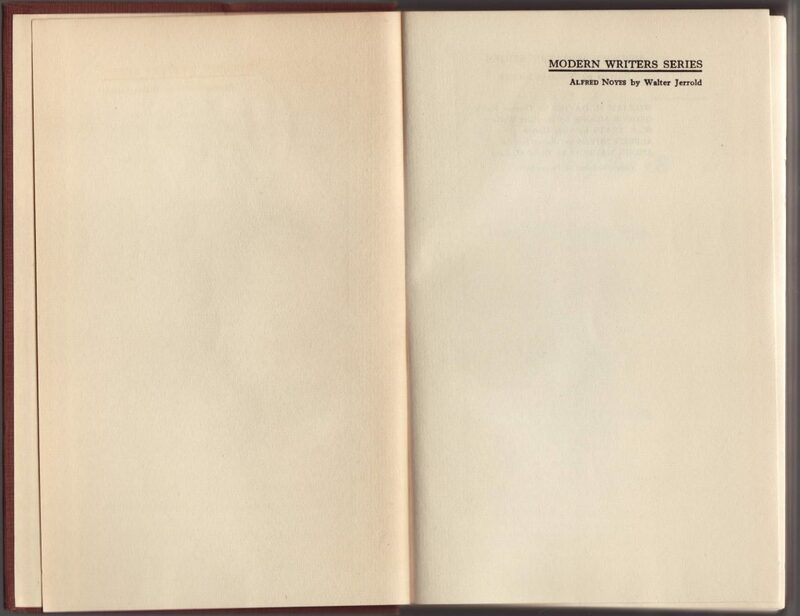 Shaylor’s Modern Writers Series is an example of a series of original books, in this case, focused on biographies of modern writers. Jackets are common to the series, indicate price (3s./6d.) on the spine and front flap. Jerrold’s biography of Alfred Noyes was first published in 1930. At this point, there were 5 books planned for the series, listed on the front flap. 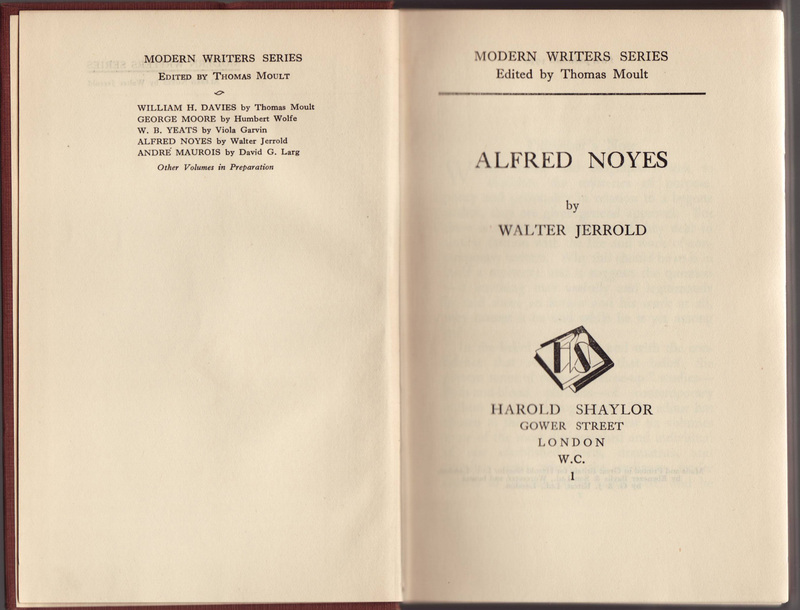 Of these five, only Moore, Noyes, and Maurois were published by Shaylor in the series. A prospectus for the series is included on the back of the jacket. Bindings were above average in quality, dark brown with gold stamping. Half title page includes the series name and the name of the book and author. 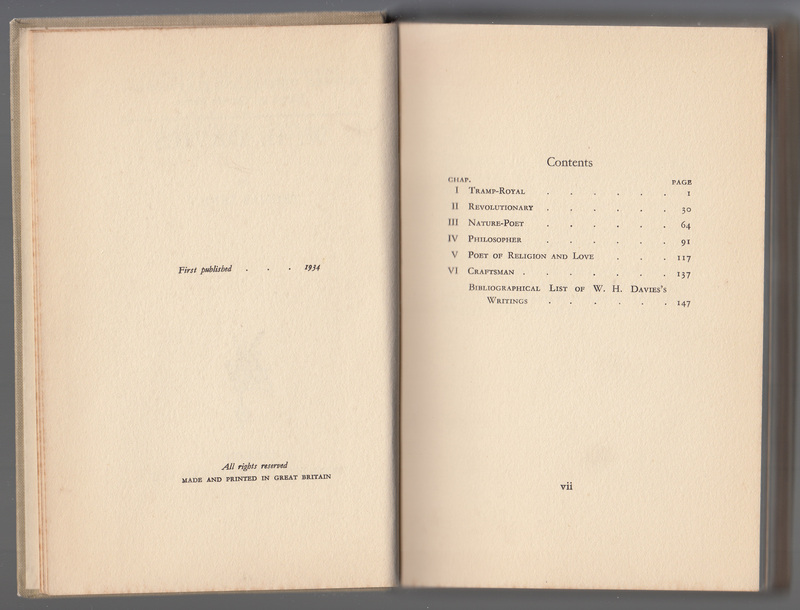 The projected five titles in the series are listed on the page facing the title page. This publication and printing data faces a “Publisher’s Note” that details the goals of the series. 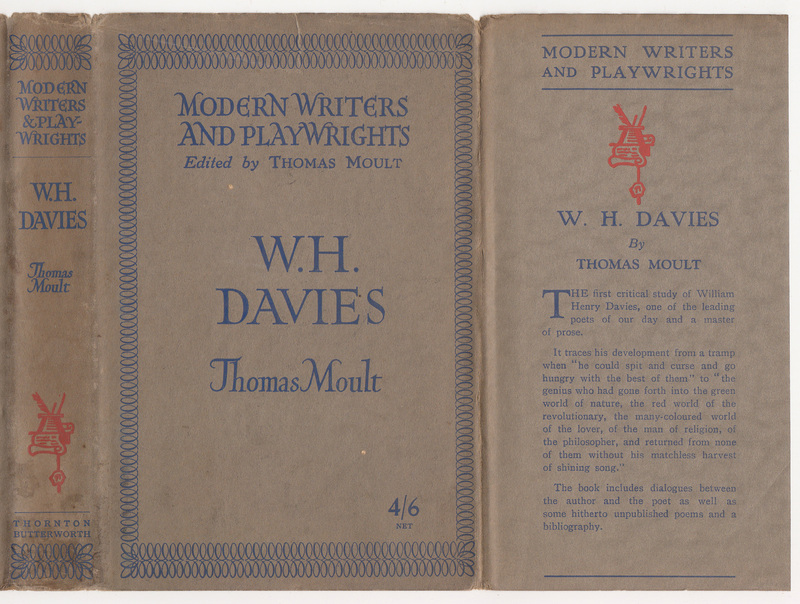 Thomas Moult was retained as the editor of the series when its name was expanded to Modern Writers and Playwrights in 1933, two years after Butterworth took over publishing the series from Shaylor. 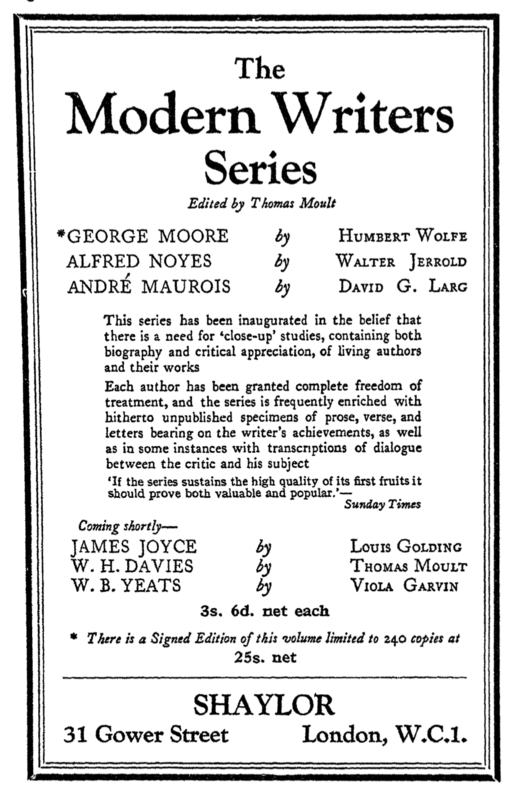 Two titles were issued under the new series name in 1933 (James Joyce, by Louis Golding and George Moore (revised ed. ), by Humbert Wolfe. In 1934 the last book issued in the series was published, W.H. 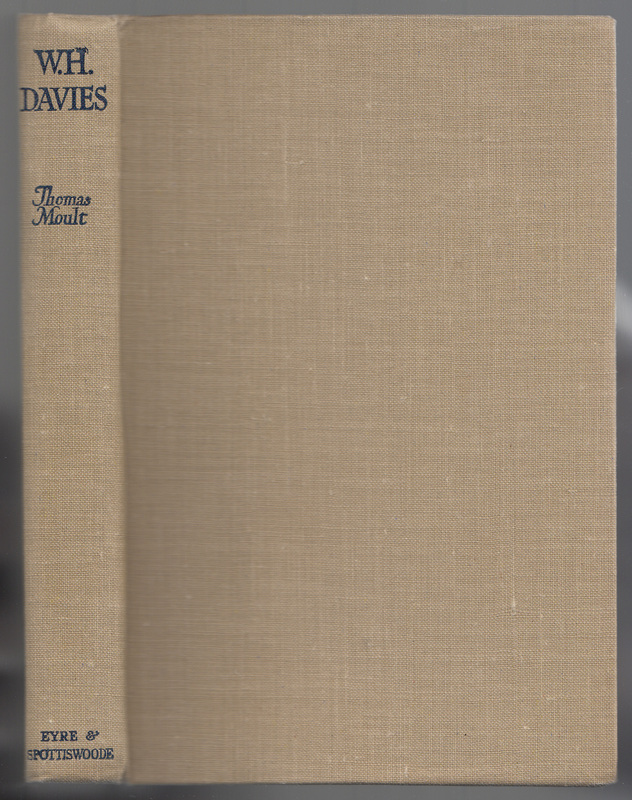 Davies, by Thomas Moult. 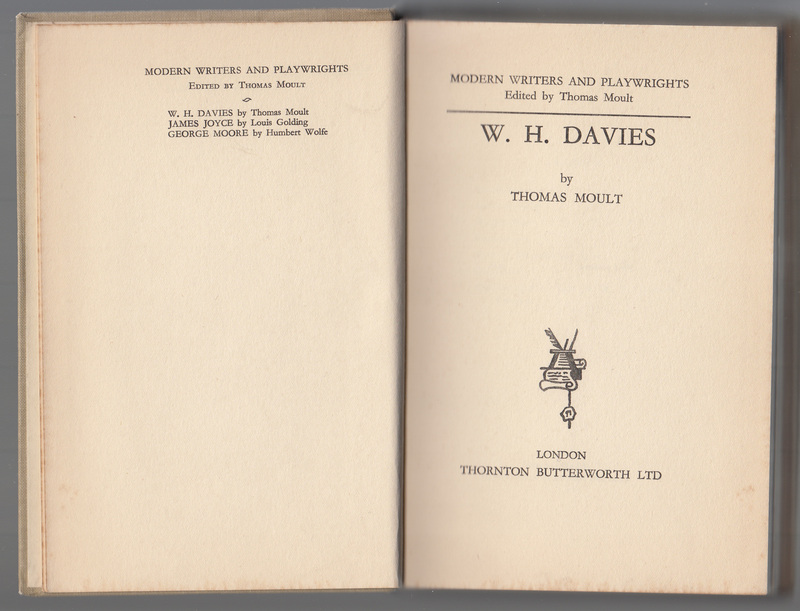 Moult’s book was originally announced in 1931, as a forthcoming title in the Shaylor series. Jackets were redesigned for the expanded Modern Writers and Playwrights series. 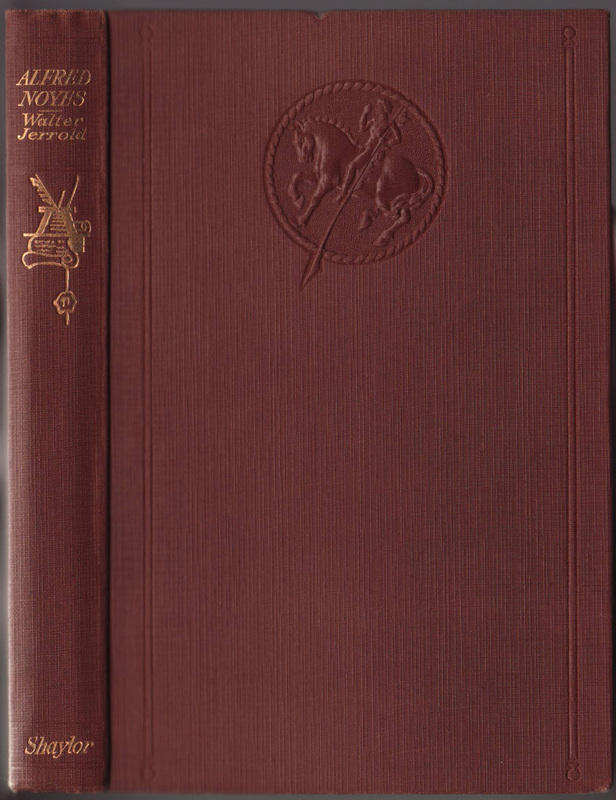 Printed on brown faux vellum with blue and red ink, the jacket spine now includes the series name in addition to the title, author, and publisher. A series colophon, printed in red, is also included on the spine. The front of the jacket frames the series name, series editor, title and author. The price of 4/6 is an increase from 3/6 on the earlier copies. The front jacket flap repeats the series name, colophon, title, author and a blurb about the series. The back of the dust jacket includes the Modern Writers and Playrights series and the three titles issued under that series name. The Modern Writers Series includes three titles published earlier, still available at 3s/6d. 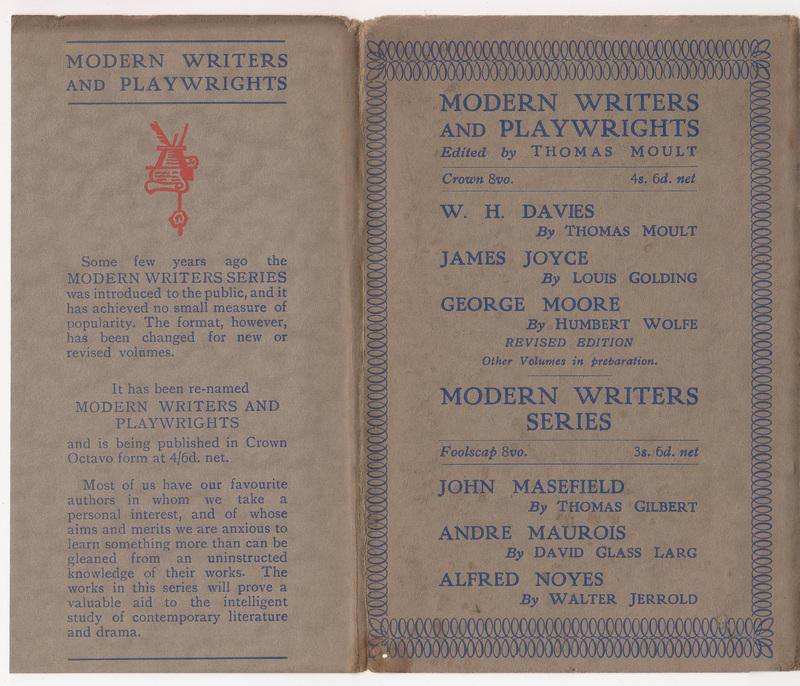 The George Moore title was issued originally in the Modern Writers Series, then a revised edition was issued under the Modern Writers and Playrights Series name. The rear jacket flap describes the change in series name. 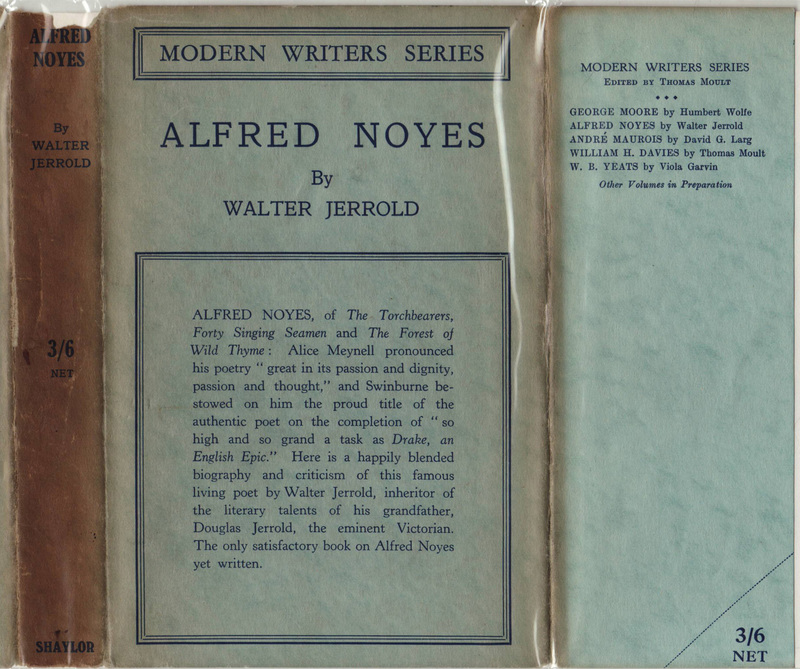 This basic binding in tan cloth with black typography actually carries the Eyre & Spottiswoode imprint on the spine. Eyre & Spottiswoode bought out Butterworth in 1941. 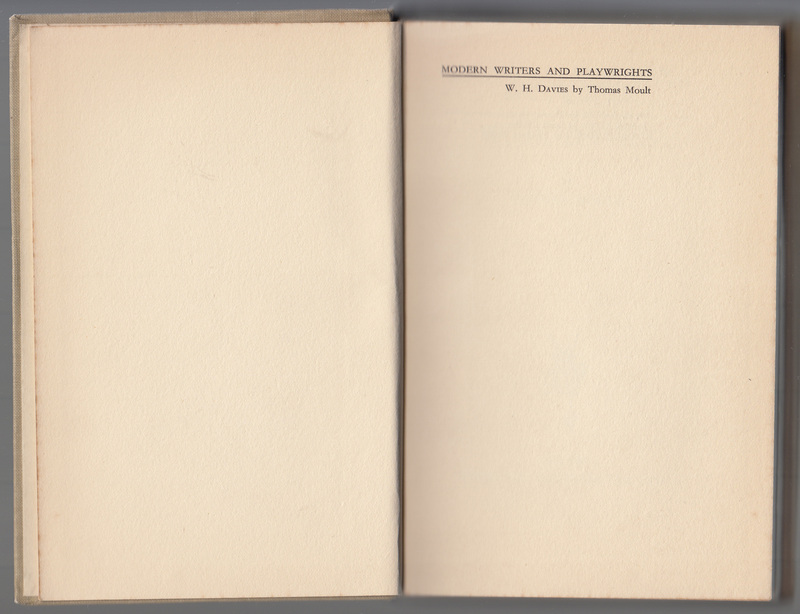 The jacket and interior of the book use the Butterworth imprint. It’s possible that this book was bound by Eyre & Spottiswoode after 1942, using unbound sheets and jackets printed by Butterworth in 1934. Thus it is “sort of” a copy of a book in the series published by a third publisher. The half title page with the series name, book title, and author. 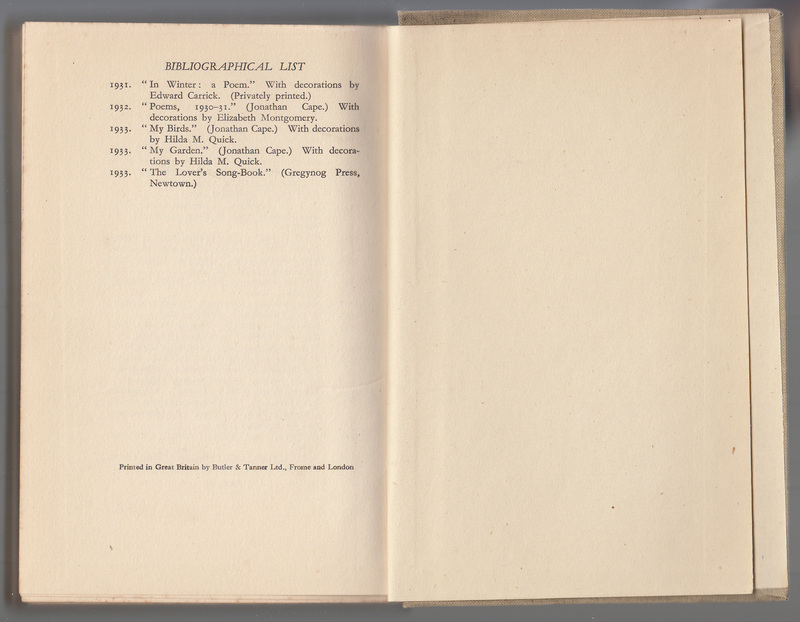 The page facing the title page lists the three titles in the revised series. The imprint here (as on the jacket) is Butterworth.